FABB produced simulation of I-66 Trail. VDOT has been very open to public input on improving the proposed parallel bicycling/pedestrian trail for the Transform the I-66 Outside the Beltway project. So, FABB is asking everyone to take a few minutes and send an email to VDOT with comments and ideas on how to make the trail better. The deadline for submitting comments is Friday, June 30, 2017. To help you with this, FABB is providing the following contact information and details about the proposed parallel trail for your use. Comments should be sent to Transform66@VDOT.Virginia.gov. You can also send messages to The Honorable Aubrey L. Layne, Jr., Virginia Secretary of Transportation through the Governor’s office at https://governor.virginia.gov/constituent-services/Communicating-with-the-governors-office. Comments that will have the most impact are those that are specific to a particular segment of the trail, especially if near your home or where you ride. Please use the material below as needed and try to keep comments constructive. Don't hesitate to share ideas about potential fixes. The engineers and designers have said that they welcome other's thoughts. Also, be sure to mention how you might use the trail and where you live (city or neighborhood). The project significantly benefits northern Virginia by connecting adjoining neighborhoods and future transit facilities. This not only facilitates daily multimodal commutes to work but also can help reduce congestion by allowing citizens to use bikes for short trips for local errands and shopping. The proposed trail expands Fairfax County's bike network, providing an extensive new east-west bike/pedestrian route plus connections to the W&OD trail, the Cross County Trail, and others. The creativity in developing many of the underpasses, grade separated, and other crossings to help cyclists and pedestrians on the trail safely traverse intersections. Hope that this and the creativity applied to the Route 7 trail bridge will continue to be applied to all of the segments of the I-66 trail. The proposed installation of bike counters to gather data on usage will be very welcomed, especially if improvements to the trail are made to insure that it is an appealing, safe, and healthy transportation option. 11 access points to the trail are a good start to increasing connectivity and encouraging use. The potential noise impacts on trail users could be high on those sections between the sound wall and the highway. Beyond exposing the users to the dangers of high decibel noise, cyclists and pedestrians may have difficulty hearing the bells, horns, and shouts of other users passing them. 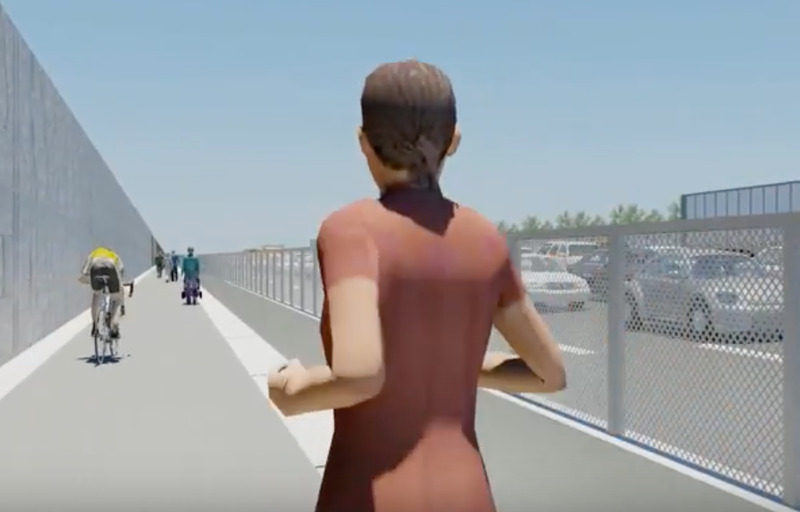 The noise impact on users inside the sound wall should be analyzed before construction begins and the results should be used by VDOT in selecting the safest and healthiest location for placement of the multiuse trail. The exposure of trail users to pollution when the trail is between the sound wall and highway not only may have negative health impacts on regular users but may discourage many from using the trail. At a minimum, the pollution levels and health effects should be analyzed and made available to potential users. EPA research concludes placing a shared use path outside of the sound wall will improve air quality by 50%. . The current plans have the trail on the same grade as the highway. With only a concrete and fence barrier and a 12-foot shoulder separating trail users from I-66 traffic, the proximity to traffic may discourage some people because of perceived dangers from the nearby motor vehicles. The trail inside the wall is very exposed and with no natural buffers to protect users from weather and noise. During the summer when heat is radiating off the highway and the trail’s pavement, the absence of shady sections to provide some relief could discourage trail use. The trail would benefit from additional access points through the sound wall. This will improve accessibility and provide users a sense of security knowing that they have more options to get off the trail if needed. While access will be provided at many of the overpasses, Jermantown Road, near Yoenas Park and Dunn Loring at Gallows Road should be provided for connectivity to transit, recreation locations and shopping destinations. Our understanding is that in many areas the trail will only be ​8-feet to 10-feet wide ​with 2-foot shoulders. We hope that, with grade separation and other improvements that the trail can be widened where possible to accommodate users, especially when utility vehicles using the trail as a service road are present. A major concern is that if the trail is not improved it will be so unappealing that it will not be used. An underutilized trail could then be used by opponents of trails and similar multimodal transportation options to then argue against them, seriously undermining VDOT goals for reducing congestion. A well-designed shared use path will provide a safe, healthy, and enjoyable experience for trail users of all ages. Comments by FABB members will go a long way to insuring that VDOT places the trail as far from the traffic lanes as possible and makes this goal a reality. There is a portion of the Fairfax County Parkway Trail between Huntsman and Modisto which runs between a sound barrier wall and the roadway. You always feel like you are in a very noisy wind-tunnel when passing through there on foot or by bicycle. This is a short section of the trail. I can only imagine that the noisy wind-tunnel effect would be worse alongside I-66.